Many people don’t realize just how we can improve memory because they don’t know how big role behaviour can play when it comes to your ability to create memories. There are, of course, two different types of memories, commonly referred to as long-term and short-term memory. 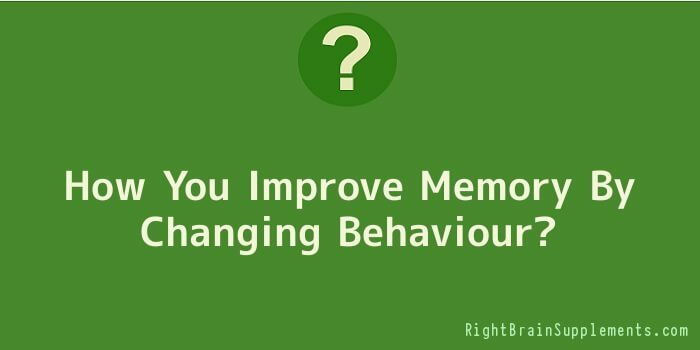 Both kinds can be enhanced by making simple changes in your behaviour, and improvements in any kind of memory can be greatly beneficial to many aspects of your life. You may find it surprising to discover just how easy many of the best techniques for improving your memory function can be. Some studies have shown that people who speak information aloud as they are reading it have a much higher chance of remembering the material later as compared to those who read silently. This is because many of us learn well through aural methods, which means that actually hearing information as it is presented can help to form stronger, longer-lasting pathways in our brains. Another intriguing and useful concept is the connection between memory and alcohol consumption. We all know that overindulgence and binge drinking has huge detrimental effects on memory, particularly in the short-term, but experts say that responsible drinking in moderation can actually be an excellent means of boosting cognitive and memory functions. There is much data available which indicates that people who consume perhaps one beer or glass of wine per day exhibit higher performance on many memory tests than both their heaving drinking and nondrinking counterparts. In red wine, for example, you find chemical compounds which are thought to improve the health of your blood vessels, and healthy blood vessels make for better memory. Similar compounds also exist in red grape juice, so even children can make the behavioural change of having a daily memory boosting drink. Another important thing to consider is that stress and strong negative emotions can easily cause deterioration in your brain’s memory centers. Depression is a particularly fiendish culprit here, even to the point that people with depression are sometimes misdiagnosed as simply having memory or cognitive dysfunction. When you think about it, this makes a lot of sense. People who are depressed are often feeling so hopeless or distressed that they cannot fully concentrate on homework or their workplace tasks, and lack of concentration spells poor memory. But these individuals do not necessarily have bad memories. They simply forget things because their lack of focus prevented them from ever really mastering important skills or information to begin with. Additionally, depression makes your brain focus on the negative, meaning it will be harder for you to remember positive or neutral information. One last suggestion for ways to alter your behaviour for greater memory capacity is to get plenty of exercise. Regular physical activity is good not just for your body, but also for your mind. Your brain cannot do its job without the energy it obtains from oxygen and nutrients in the blood flowing through your veins. Thus exercise has been determined to increase cognitive function. Never underestimate the power of behavioural changes. Yes, you can come up with tricks and funny devices as a memory aid, but that will never fix all your problems. Making lasting improvements in your memory requires altering your lifestyle and behaviour.